Levering 1 - 4 dage. 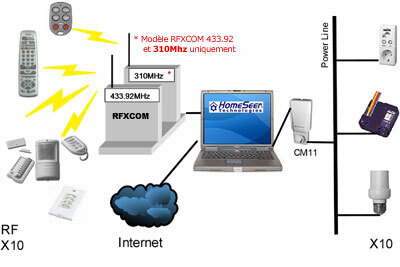 This interface will allow you to increase the reception and RF transmission capacities of your home automation system. It connects to a USB port of your computer or some compatible home box, and from a compatible software you can control your entire home automation system. Equipped with an extended flash memory, the RFXtrx433XL interface supports more protocols. Available in a nice and compact design, this product will allow you to communicate with many commercial devices, such as the Chacon / D-IO range, OWL, X10 ... The RFXtrx433XL also offers compatibility with Somfy RTS protocol , present on Somfy rolling shutters installation. The RFXtrx can be updated directly from a computer to make it evolve by following the latest updates developed by the RFXCOM team. This interface is also perfect for developers who want to create their own software.